Has your vehicle made its final pass over Interstate 93? Perhaps your car has since been wrecked or has mechanical issues that prevent it from getting you around as reliably as you'd like. You might be considering selling your car to one of the many junk car buyers in the Concord area. Unfortunately, what you'll find with many of these buyers is that receiving a fair offer for your vehicle isn't always possible. When you sell your car directly to DamagedCars.com instead of a local salvage yard, however, you can receive a fair and guaranteed offer in a matter of minutes. The best part? You can do it all from the convenience of your computer or mobile device! DamagedCars.com has been buying salvage cars, damaged cars, and other vehicles from sellers just like you for years. As such, we have developed a great reputation in Ames and the surrounding areas for being easy to work with and providing fair offers for cars regardless of their condition. And unlike most junk yards or salvage yards, we offer free towing and pick-up directly from your location; that's one less hurdle for you to jump through when selling your car! What do I need to sell my car in Concord? The state of New Hampshire has some specific requirements that need to be followed in order to legally sell your vehicle to us, but we strive to make the process as simple as possible. Specifically, we'll need to obtain your vehicle's title (clean and clear) as well as a set of keys. A copy of your vehicle registration and bill of sale is recommended, but not required by state law. If your vehicle has license plates, you'll also want to remove these prior to your vehicle pick-up; these can be returned to your local DMV branch. How much can I get when I sell my car in Concord? Unlike your "typical" Concord junk car buyers, we take any upgrades or recent repairs you put into your vehicle under consideration when we buy cars online. And as always, your offer is guaranteed! 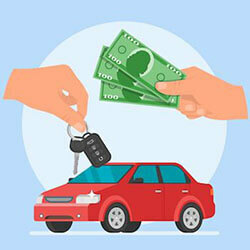 We make it quick and easy to get cash for cars in Concord, regardless of vehicle condition. And because we provide online offers, you save the hassle of visiting local scrap and salvage yards in-person. You can also save money and time by taking advantage of our free towing/pick-up services when you sell your car to us! Concord serves as the capital of New Hampshire and is also home to a few notable colleges and universities, including University of New Hampshire School of Law and St. Paul's School. Whether you live in Concord or one of the many surrounding communities, our car-buying and pick-up services are available to you! We'll gladly pick up your car from your home or place of business. Get started with your FREE guaranteed offer from DamagedCars.com today by filling out our online request form. From there, you can have payment in-hand in as little as 48 hours. What should you know before selling to a junkyard or private buyers in Concord, NH?